If you are an ardent user of foursquare you might have noticed this earlier. Foursquare are opening a foursquare store on 16th of April 2011, and they are calling it 4/4²/11. Last year, a group of foursquare users in Tampa dreamt up a fun new way to connect with all the other foursquare users in their area. Marking 4/4^2 on their calendar, they declared the first foursquare(d) – get it, four squared = sixteen – day, 4/16. As word spread, nearly 300 local 4sqday parties took shape, from Kansas City to Kuala Lumpur. This year marks the second annual 4sqDay and foursquare’s second birthday. Foursquare has 8,000,000 people in the foursquare community, making 4sqDay a success. Nice way to launch products for sale on their website. By making a huge event while at it and make everyone want to participate. If you aren’t familiar look at the The Foursquare Day Story, and The Foursquare Day FAQ might be a good place to start. For some extended thoughts on what makes a local Foursquare Day event awesome visit the Community Guide to a Successful Foursquare Day, which was one of our most popular posts last year. For further information, check out RESOURCES. Make sure you follow the official Foursquare Day foursquare account, Twitter account, “like” Foursquare Day on Facebook, and RSVP to the worldwide Foursquare Day 2011 meetup event. Encourage all the folks in your community to do the same. Everyone who’s celebrating Foursquare Day should click “count me in” on your town or cities Foursquare Day meetup page on meetup.com. If you don’t see your town be sure to add it, and if there’s no events listed for our town or city on meetup please consider planning one (and updating the meetup page)! If you do plan to organize an event be sure your town or city is also listed at Foursquare Day Local which is how we’re keeping track of all the organizers. If your community is already listed on Foursquare Day local then contact the community organizer and combine forces! Also, if you know there is a foursquare day event or community in your area that is not listed on meetup or on our organizer list then pelase contact them to see what they are planning and get them on the lists. Of course if there is no foursquare community in your area, go ahead and list yourself – you can add more info later as you know it. Consider creating a foursquare meetup community event on 4/16. For maximum impact, start planning as quickly as possible. Check out our post from last year on how to throw a great party for your community on Foursquare Day. Update your pages meetup.com event with your new plans and then be sure to Tweet about your event and use the hashtag #4sqday!! Remember, one motivating factor for many participants is the Swarm badge. To get it you need to have at least 50 unique foursquare check-ins at the same venue within a single 3 hour period. Encourage local businesses to sign up for foursquare using foursquare’s business signup page and then register a special offer for 4/16. Connect with your local chamber of commerce to superpower this effort. Then share the news of businesses in you area providing Foursquare Day offers within your community and go out and patronize those businesses on Foursquare Day! Additional ideas and resources for local businesses can be found here. Use those new foursquare ambassador cards! 6. Get the real Mayor of your town or city to proclaim 4/16 as Foursquare Day!! We did it last year and you can do it, too! Check out all the cities that are currently working on this project, and add yours to the list if it’s not already there. 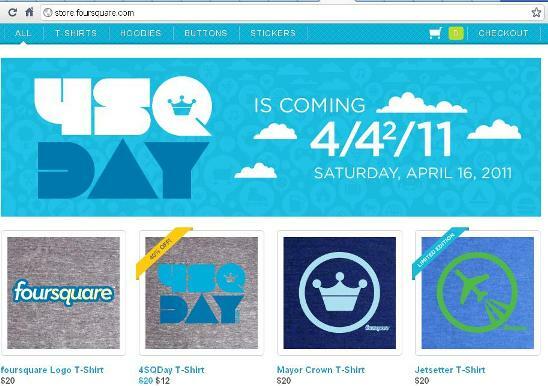 Then read 4sqCincy’s blog post on how they got their Mayor to proclaim 4/16 as Fourquare Day. 7. Talk to the media! Call up the newspapers and talk to your local TV and radio. Consider a press release. Foursquare Day, as agrassroots movement, makes a great and positive story. Use the global slogan, “Foursquare Day: When the World is Your Venue!” Maybe do something cool and newsy at exactly 4:16PM in your timezone. Don’t forget to post the pictures and the videos online! 8. And most importantly, have a great Foursquare Day!